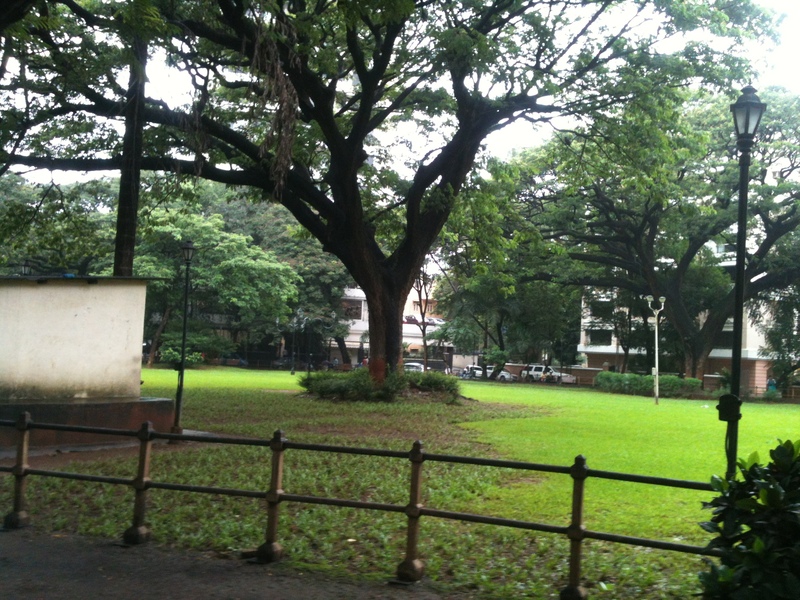 Five Gardens area in Matunga is part of the famous Dadar-Parsi colony. 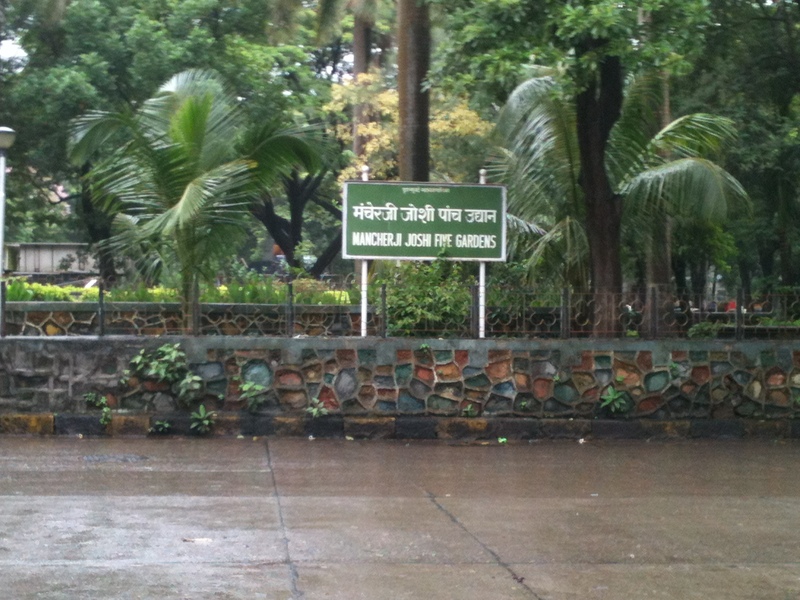 This area was specially established for the upper class Parsis in the very early 19th century by the efforts of Mancherji Edalji Joshi, a renowned Parsi patron. The British however built it under the scheme of Bombay City Improvement Plan for the localities of Dadar, Matunga, Wadala, Sion in 1899-1900. So this is the first planned area of the city with spaces allocated for residences, green space, schools and colleges with proximity to transport infrastructure (courtesy: Wikipedia). The purpose was to de-congest the city after the Bombay Bubonic Plague Epidemic which broke in the September of 1896. 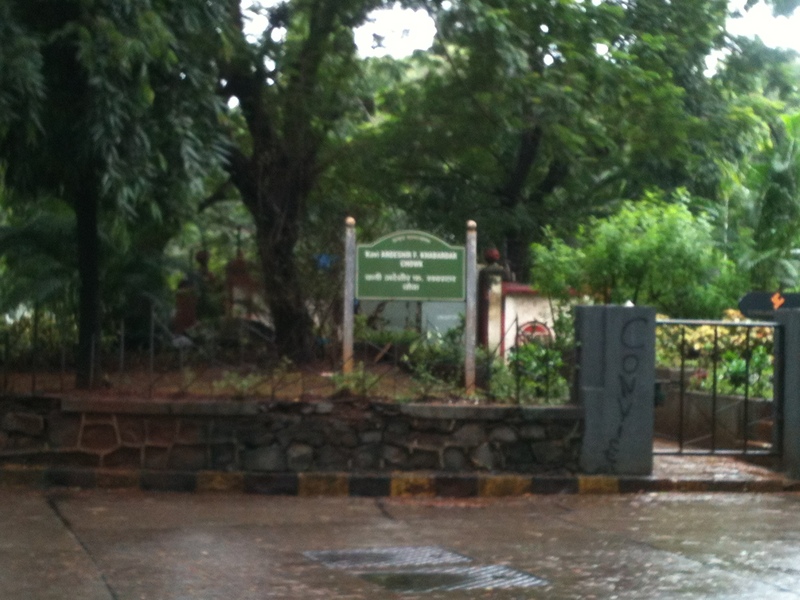 According to the plan they wanted to house about 60,000 people in Sion and about 85,000 in Dadar & Matunga. Now there is as much people in every square kilometer of this area (pardon my exaggeration!). So back to the garden itself. 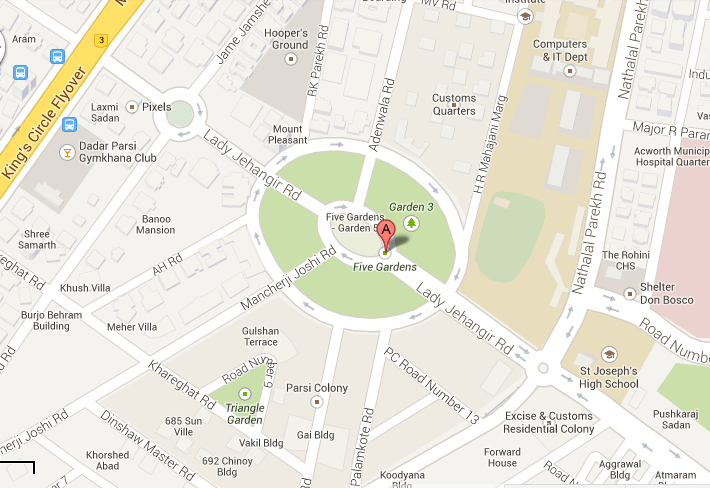 These are exactly five gardens just like shown in the map above. Getting here is quite simple. This is at a walking distance from King’s Circle and if you take the train get down at either Matunga or King’s Circle Railway Station and then take the taxi. The garden itself is like any other Government infrastructure waiting to fall apart. Guess this is like a wrestlers’ joint with bars and dumb bells. I was wondering If I should interrupt this gentleman and warn him about the tetanus shots he will have to take after his workout! There is hardly anything anyone can do to screw up trees, (unless one cuts it) so here they are flaunting their luscious canopies. The roads around this area are adorned with beautiful tree avenues. 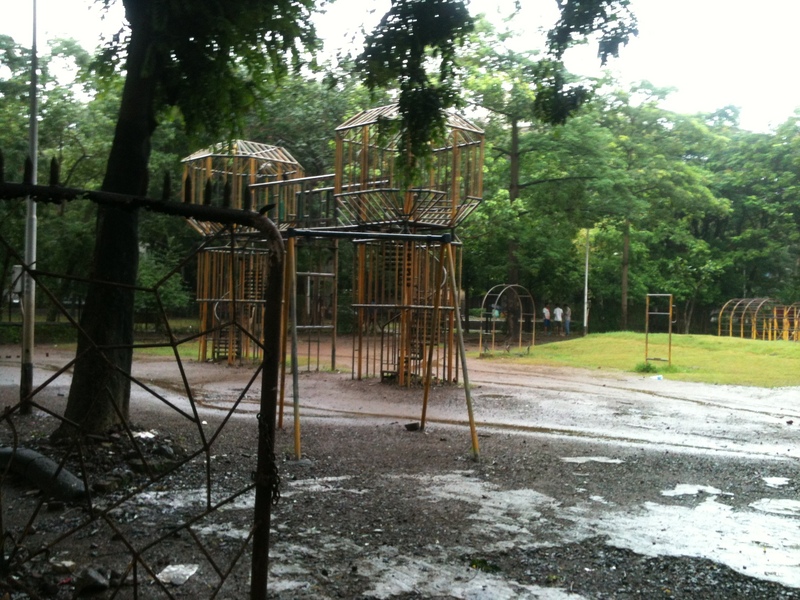 The slides in this play area is broken, rusted and stepping into its grave. The ladder behind to climb over has withered back into nature. 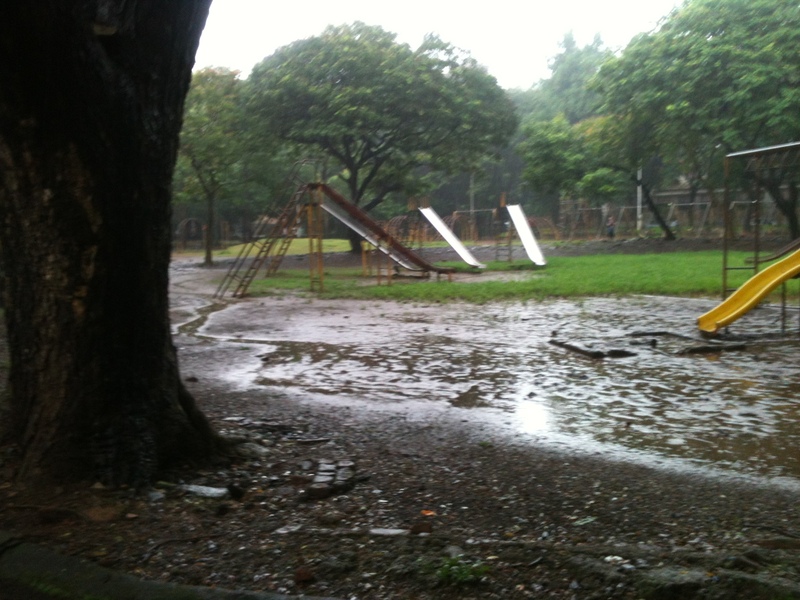 The muck and the rains make it even depressing. 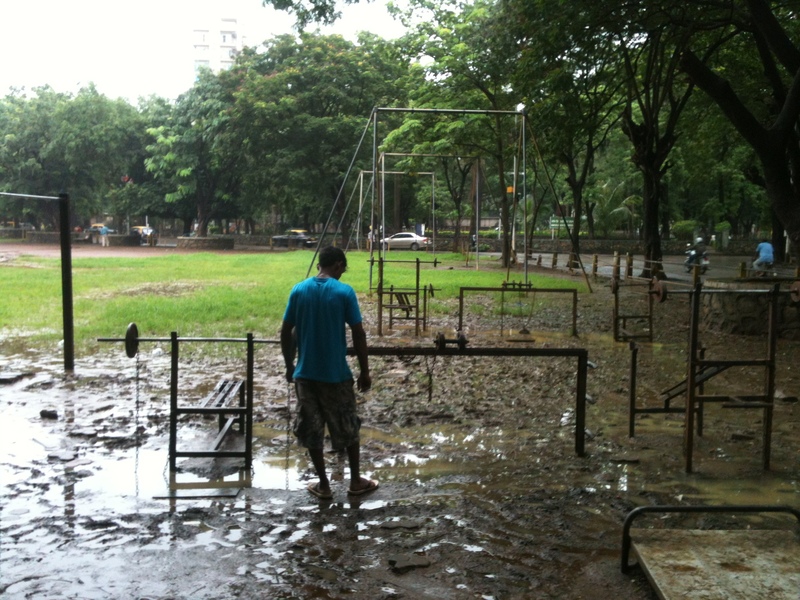 Actually the puddles in ground here provide an opportunity to creatively play the game of hopscotch. This sort of iron-pipes structure stands erect but am bemused at its purpose. I can guarantee that only a wiggling movement by a kid is enough to put down this engineering marvel. 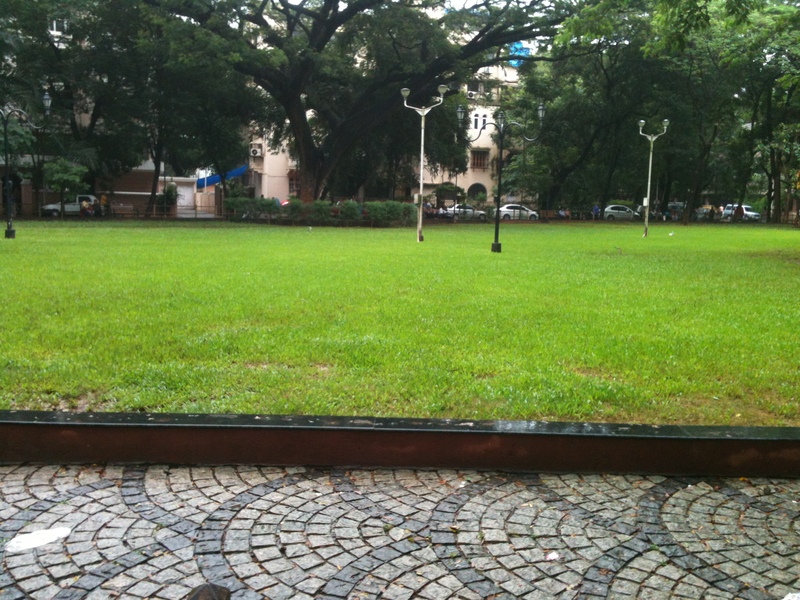 People will make use of open space howsoever the space is. 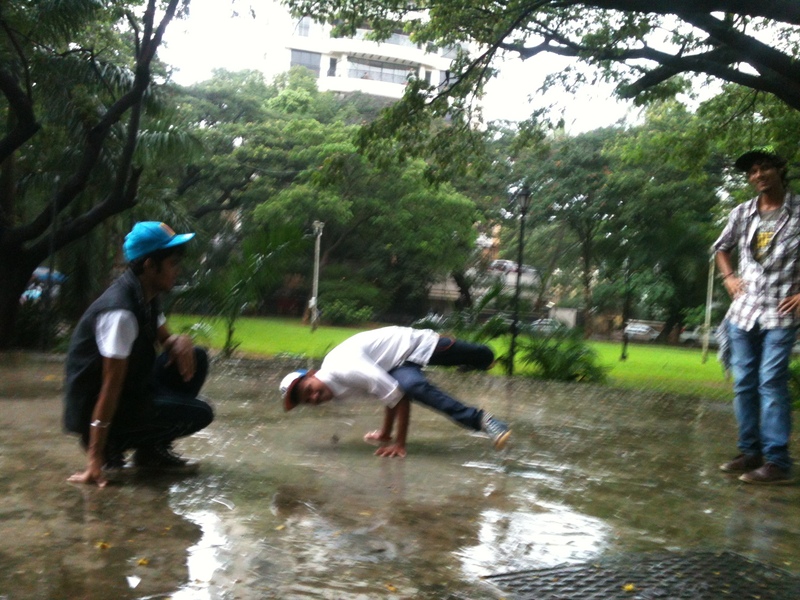 I caught these boys doing an impromptu street dance even when it was raining. They were a sport and posed in front of me to take this picture. 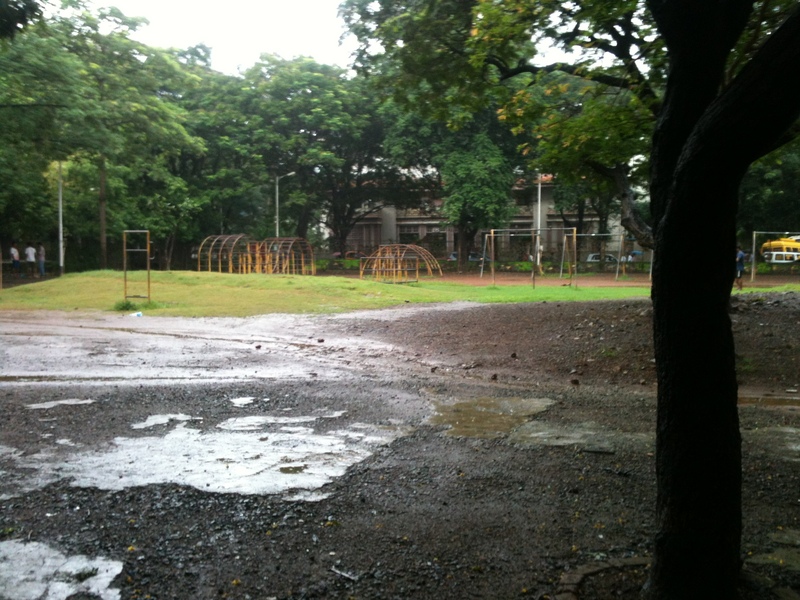 Besides you will find a lot of love birds flocking under the trees and ducking low behind the benches. You will find a lot of senior citizens walking around but they smartly avoid sidewalks. I overheard an old gentleman chiming away on his smart phone, “Arre Jignesh bhai, tame mane yaad kar sho jyare bazaar upar chad se“. If you are like me an amma (mother) with a wiggly toddler in the stroller, then this might not be a nice place to move around. The pavements don’t have tiles. And If your child insists to push the stroller by herself then you are in trouble. Also beware of the flying cricket balls that might take you down in a whiff. Don’t enter these gardens in the evenings just when its going dark, mosquitoes and some shady people might look at you like you are their feast. 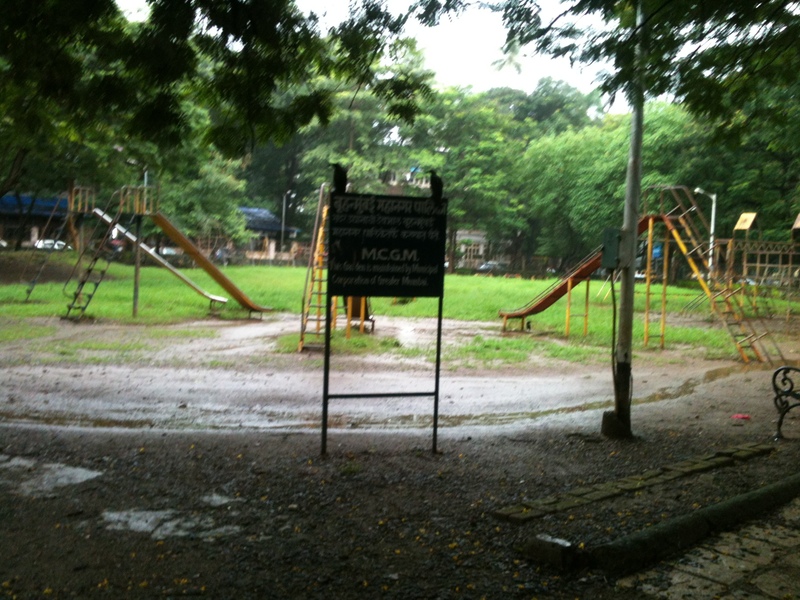 Friends of mine who grew up around this area have fond memories of this place. They now take a pass when I talk about coming here, I know now why! Such a special place.. Well you captured all sides very well.. Every way :). 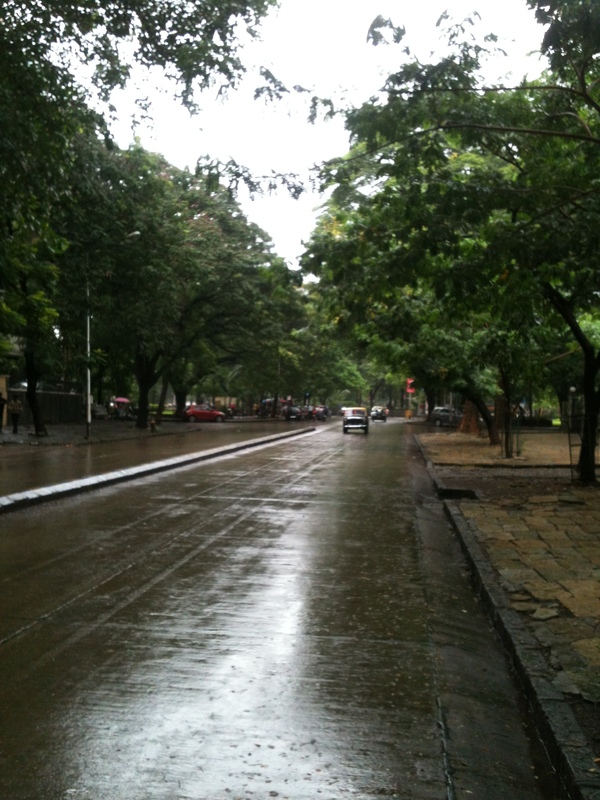 Still a paradise in Mumbai with no rickshaws, spacious walks relative to the suburbs and the most splendid tree cover, for a place in the center of our city. Cheers..